It was reported by China Legal Daily that two Chinese businessmen were recently lured by secret agents of US to Hungary and later arrested and extradited to US for attempting to export anti-radiation PROM chips that can be used for outer space and military purpose, which are classified as USML items. Two Chinese exchanged emails with the secret agent who disguised as the CEO of an American trade company. The report said that they were misled that the transaction would be permissible via a third country. They were arrested when flew to Hungary to collect the goods from their trade partners. The Chinese report said they were entrapped by US secret agent and extradited without due process, such as presence of Chinese Counselor and Chinese translation of Hungarian court decision. Interestingly, one of the Chinese, Yuan, was almost extradited from UK to US for Human Magic Power’s trademark dispute with an American company called ABRO Industrial 3 years ago. Yuan claimed that he was lured by Abro to UK for negotiation of the trademark ABRO ownership of which was under retrial at Beijing High Court but was arrested on aircraft landing in London Heathrow Airport. Fortunately Yuan managed to go home thanks to a misspelling of UK court decision. He did not have the same luck this time and has to face US court trial. The series of entrapment extradition cases may alert the Chinese businessmen that they should be aware of foreign laws and regulations for international trade. However, ABRO trademark case is still puzzling. Based on limited information available, American Abro does not have any legal ground to seek criminal sanction under US law against a Chinese company that applied for registration of an identical mark with the Chinese Trademark Office. Perhaps, the Chinese company exported goods to US market using the mark ABRO. It proves my guess that Yuan’s Hunan Magic Power indeed shipped alleged counterfeit goods to US and many other countries. In 2005, Hunan Magic allegedly shipped $22,000 worth of products to Livingston Parish, Lousiana, sparking the charges that led to Yuan’s arrest in London. Under Louisiana laws, among the toughest in the U.S. against counterfeiting, he could face millions in fines and up to five years in jail. Since the Chinese government has no extradition treaty with the U.S., meaning Yuan would likely only be sent back to face those charges by a third nation. That was the beginning of Heathrow arrest. US has extradition agreement with more than 100 countries. It seems it still pretty dangerous for Chinese businessmen who have been targeted by US law enforcement to go abroad. 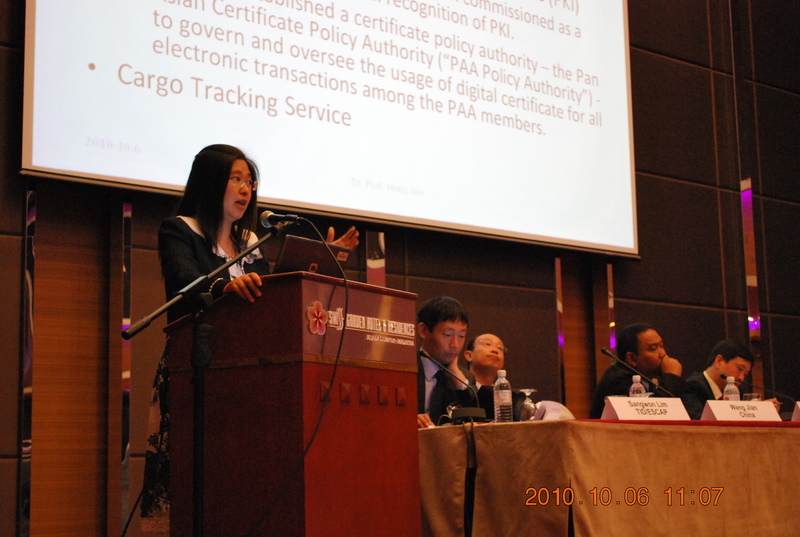 “Domain Name Dispute Resolution and ODR: Asian Perspective” was held on 15 October 2010 in Beijing Shangri-La Hotel New Wing. The Conference is to further improve the substantive and procedural rules on domain name dispute resolution, develop relevant theories and practice in terms of online dispute resolution, strengthen the communication and cooperation of theoretical and practical workers in this field and promote the domain name and online dispute resolution services provided by ADNDRC. The conference is organized jointly by CIETAC, Asian Domain Name Dispute Resolution Centre and Hong Kong International Arbitration Centre. Scores of presentations given by government officials, domestic and foreign scholars, judges, lawyers and representatives from enterprises were listened by a decent number of audience. A lawyer from Hong Kong, a Korean professor and Prof. Hong Xue gave the presentations in English. An ICANN staff from contract compliance department gave a briefings in Chinese. There were little chances for interactions. Presenters did not even talk with each other. The whole day was long and uninteresting. Almost the whole morning session, full of empty congratulations, best wishes and formality greetings, was rather boring, until Prof. Hong Xue opened the discussion on substantive issues: UDRP para.4(a)(i). But it was past 12 o’clock, holly time in Beijing for lunch. People got impatient to think about whether laches of a complainant could be a defense under UDRP. Okay, everyone then went to lunch. Afternoon session was not much better than the morning. People on podium seemed talking to themselves. Audience were tired. One presenter proposed to eliminate “bad faith” condition from DRP. Well, it is new but destructive. UNESCAP and UNECE jointly launched the The United Nations Network of Experts for Paperless Trade in Asia and the Pacific (UNNExT) to promote implementation of Single Window and paperless trade.Prof. Hong Xue was the only Chinese and the only legal expert in the group. Prof. Xue is tasked to draft a Regional Agreement on Electronic Exchange of Trade Data and Documents. UNNExT aims to assist local experts of the region to adopt global standards and solutions for trade document and data requirement simplification and harmonization, as well as to support national, subregional and transcontinental Single Window initiatives in the Asia-Pacific region for trade facilitation. The first Conference was held in Swiss Garden Hotel, Kuala Lumpur on October 4, 2010, followed with Asia-Pacific Trade Facilitation Forum 2010: “Trade Facilitation for Regional Connectivity: Advancing Paperless Trade” on October 5-6. Prof. Xue presented the analytical study of the draft Agreement to government officials, traders and public and private service providers from Central Asia, South, Southeast and East Asia as well as the South Pacific. Advisory Group on Legal Framework for National and Regional Single Window has been established in March 1, 2011. Prof. Xue is the only member in the Group from UNNeXT.